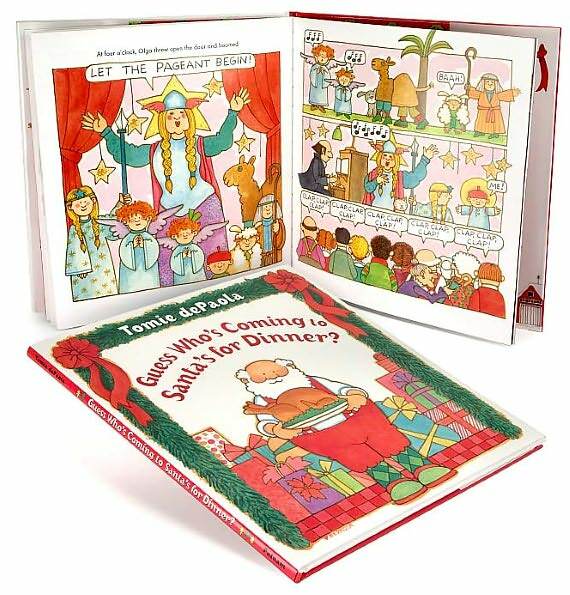 However, were you aware of the plethora of other holiday-themed books penned and illustrated by Tomie dePaola? 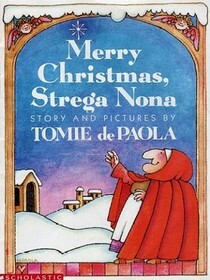 You’ll want to follow Merry Christmas Strega Nona with dePaola’s new Christmas book in the S.N. series entitled Strega Nona’s Gift,winner of the Laura Ingalls Wilder Award. What I love best about Strega Nona’s Gift is that it introduces readers to many Italian holiday traditions and celebrates not only Christmas, but also the Feast of San Nicola and the Epiphany, two very important celebrations for Italians. 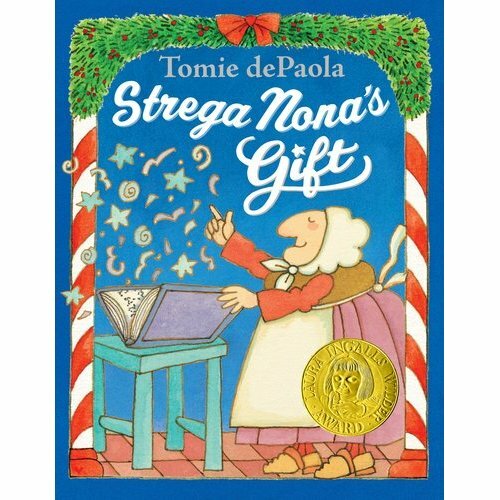 Featuring two of dePaola’s best-loved characters, Strega Nona and Big Anthony, Strega Nona’s Gift is the perfect companion to Merry Christmas, Strega Nona. Guess Who’s Coming to Santa’s for Dinner? is a tongue-in-cheek peek inside the mayhem that ensues when Santa and Mrs. Claus invite just about everyone they know, including a polar bear, to Christmas dinner. You may well be reminded of some of your own holiday gatherings with picky guests and frazzled hosts; however, all is well that ends well, for everyone has a delightful time by evening’s end. Four Friends at Christmas is the sequel to Four Friends in Autumn, both of which are adapted from dePaola’s 1977 Four Stories for Four Seasons. 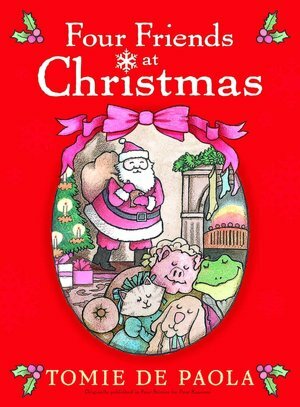 This sweet Christmas tale opens a window to the friendship among a pig, cat, dog and frog during the holiday season and shows the lengths to which Mistress Pig, Missy Cat, and Master Dog will go in order to make Mister Frog, who wishes to celebrate Christmas for the first time, happy. In past winters Mister Frog has always been hibernating and has missed all the fun. Despite his ill-timed nap this year, when Mister Frog awakens on Christmas Eve, his holiday dreams come true thanks to some holiday help from his friends. 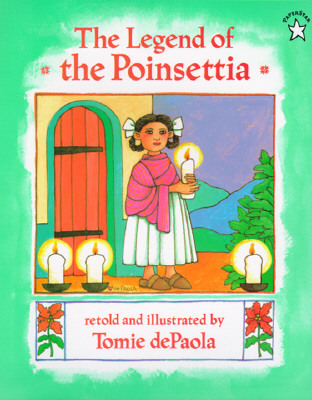 For readers who want to delve further into Tomie dePaola’s marvelous world of Christmas, be sure to read The Legend of the Poinsettia next. We move from the Italian peninsula to Mexico where the poinsettia, called la flor de la Nochebuena–the flower of the Holy Night–blooms at Christmastime as the symbol of a little girl’s unselfish gift to the Christ Child. 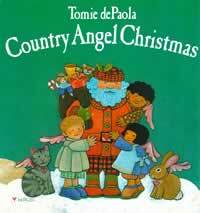 Have you seen Country Angel Christmas? 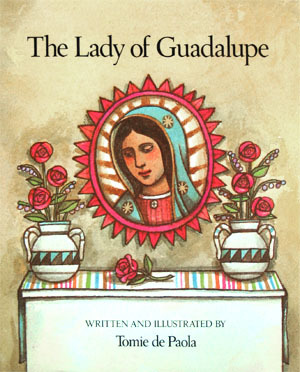 How about The Lady of Guadalupe, a tale celebrating her December 12th feast day? 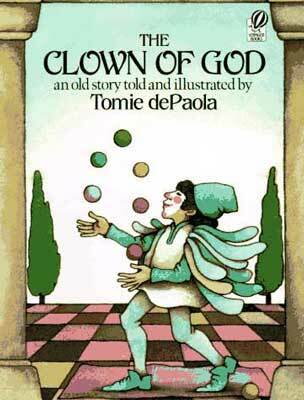 Tomie dePaola’s retelling of the old French legend The Clown of God recounts the story of Giovanni, and orphaned street urchin and juggler who offers to the Christ Child the only Christmas gift he has — himself. Be sure to keep your tissues at close range when you reach the conclusion of this powerfully moving tale. 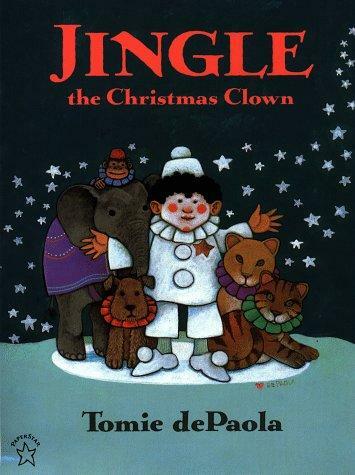 In Jingle the Christmas Clown the magic of Christmas prevails when Jingle and his baby animal friends give an unforgettable Christmas Eve performance in a small village that couldn’t afford to put on their traditional show. After Christmas day, many will celebrate the Epiphany, often called Little Christmas. 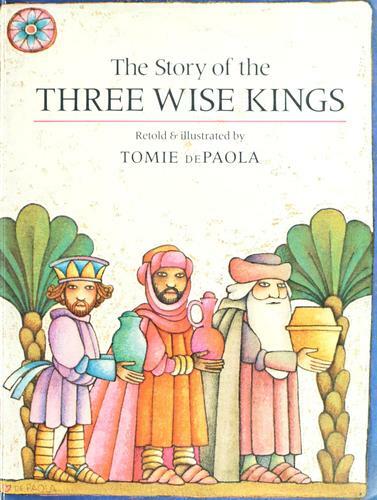 The Story of the Three Wise Kings recounts the legend of their voyage to Bethlehem to pay homage to Jesus. They encounter Herod en route and are later warned by an angel to travel a different path home. In what has become my favorite dePaola holiday book, The Legend of Old Befana captures this mystical figure in all her glory. 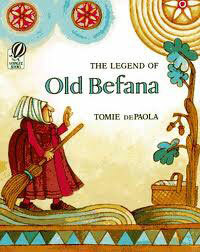 Many versions of the Befana story exist, but I will share one here. According to the Italian legend, La Befana was a grumpy old woman who lived alone on the road the three Wise Men traveled on their journey to find the baby Jesus. When the three Wise Men stopped to ask directions to Bethlehem, they invited La Befana to join them, but the old woman was too busy sweeping her floors. When she finished her chores, she regretted her decision, gathered up some gifts for the Christ child, and ran off down the road following the bright star in the sky. La Befana never did find the blessed savior, but she did not give up and searches for him anew each year in every home where a child resides. Arriving on broomstick, La Befana leaves gifts in the shoes or stockings of good boys and girls and a lump of coal in those of naughty children. 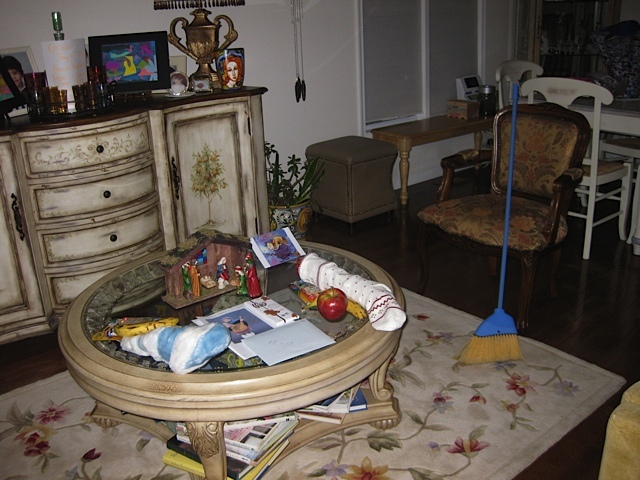 Just before she departs, she sweeps the floors and leaves her broom in the corner. 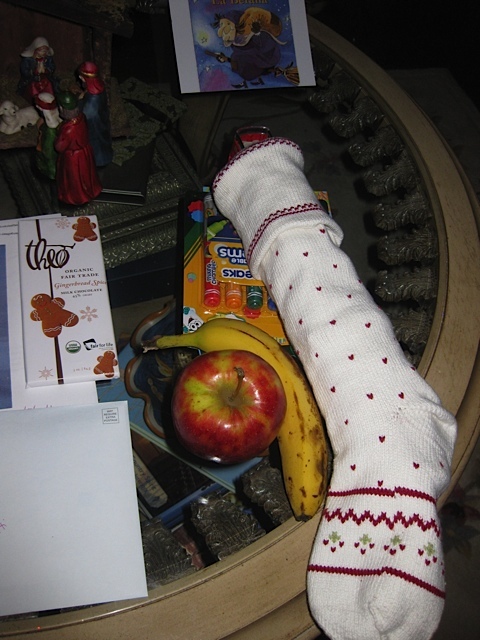 La Befana was a poor old woman, so her gifts are simple, but no less precious for so being. 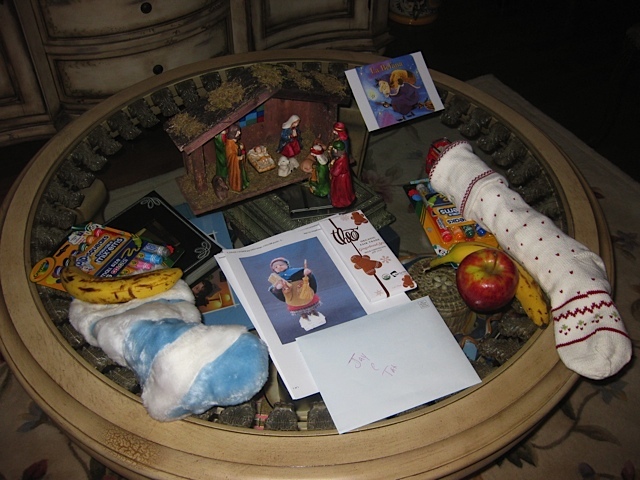 My children, who eagerly await the Epiphany, derive as much joy from the sweets, fruits, and crayons La Befana bestows upon them as they do the more substantial gifts old Babbo Natale (Santa Claus) deposited under the tree just over a week before. Another slightly sadder version of La Befana’s story, along with crafts, a story book, songs and games, can be found at the John D. Calandra Italian American Institute website. May your season be merry, bright and blessed, whatever holidays you choose to celebrate in your home. One of my absolute favorite picture books authors, *sigh*. The only one I haven’t read is Jingle the Christmas Clown. I need to lay my hands on this. In our school library we have a video of Tomie made in his barn/studio at the bottom of his garden where he talks of his creative process. What a beautiful, gentle, childlike man! I’ve added two more books to the list. I don’t know how I had forgotten them. 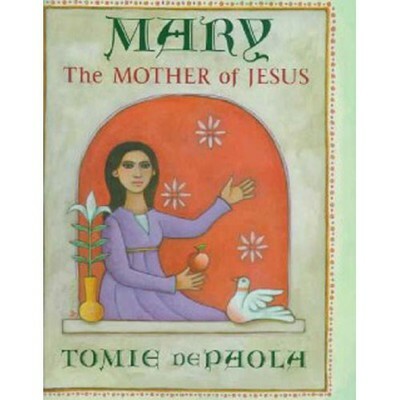 Tomie dePaola is a tireless author and illustrator. Just how does he do it? I’d love to see the video. Do you know the title? I’ll try to find it at my library too. I vaguely recall seeing the exact one you mention, but I can’t recall where. Thanks so much again for commenting!